Monitor which apps your child uses and how often. Decipher Screen Time runs on your computer and NOT directly on your iPhone/iPad/iPod. Tap the free trial button above to send yourself a download link for Mac and Windows. The free trial will let you see high-level use information. Upgrade to the paid version to see all of the specific app information. After purchasing the full version for $9.99 you’ll be sent a license code to unlock all the features. You only need to plug in the iPhone one time if you enable WiFi in iTunes though! Decipher Screen Time will detect the iPhone and download diagnostics. See this iPhone's Use History. See what apps are being used on this iPhone and at what time of day. 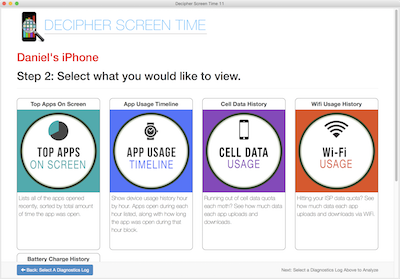 Click here to purchase the full version of Decipher Screen Time to see what apps your kid is using on their iPhone. Software upgrades and updates are free forever and customer support is attentive and quick to respond if you ever have an issue. No problem! Your free Decipher Screen Time trial has no time limit. Kick the tires and let us know if you have any questions. We also encourage you to check out our customer testimonials from Decipher Tools users around the world.